Our green pyramid 6x6 fence post caps are ideal for anyone who wants to add a colorful decorative touch to their existing fence posts. They’re also an excellent choice for anyone who is in the process of designing a fence or deck railing. They also offer a solution to anyone who is sick of having to worry about what will happen next to their wooden post caps and the maintenance that wood requires. All of our ASA resin post caps are made in the U.S.A.
Our pyramid 6x6 fence post caps are made of ASA resin. It is a material that is widely used by auto and marine vehicle manufacturing companies. It is both UV and impact resistant. We guarantee all of our ASA resin post caps against discoloration, fading, and warping for ten years. That guarantee is proof that we believe in the strength and durability of ASA resin. Our ASA resin 6x6 post caps are strong enough to withstand the worst weather conditions that Mother Nature delivers to any part of the United States. 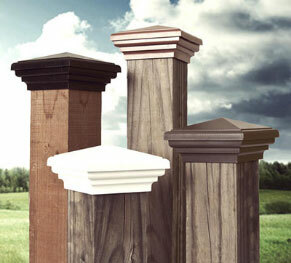 Our ASA resin fence post caps cost a fraction of what comparable wood post caps would cost, and they last longer, too. And they don’t require any maintenance.